Slipped Disc | The beginning of the end for classical radio? 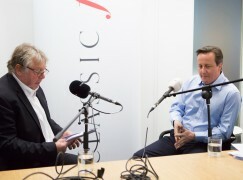 The beginning of the end for classical radio? A new-tech listening model launches this morning in Salzburg. Named Idagio, it offers unlimited access to a curated classical database, where the choice of what plays is yours, not some anonymous producer’s. Better still, it gets to know what you like and anticipates what to play in case you’re too worn out to choose. As of noon today, the app is available for download. 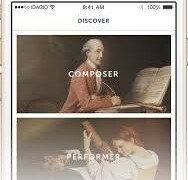 Idagio’s USP is the most advanced set of metadata ever applied to classical music. Unlike Itunes and Spotify, which pay peanuts to musicians, it offers fair trade streaming to participating artists. Thomas Hampson, Franz Welser-Möst and the Vienna Phil are among the first to sign up. Check out the app here. As far as Slipped Disc can see, this is very much a sign of where classical listening is heading. At the moment, we have two broadcast models – music you’ve heard 100 times before and never need to hear again(Classic FM) – and music chosen for you by people who know oh-so-much-better than you do what you should be hearing (BBC/NPR). These narrowcasters become redundant once Idagio – or the next-gen metadata operator – returns choice to the listener. How dumb that it is available only to “iOS” people! Hi Olassus – Christoph here from the IDAGIO team, thanks for your comment. We decided to focus our resources on iOS first to make sure we get the product right, but will definitely expand to Android in the near future. Also, we’re working on a web app / browser version that will be available this fall. Funny enough, Stereophile just re-published this piece by J. Gordon Holt: from, wait for it, 1974. It was written (typed, I daresay, with molten lead) at a time when a tiny mineral tip hopping up-and-down a thin spiral groove moulded on a flat plastic cake was the state of the art in mechanical music reproduction. this is Lukas from IDAGIO. It’s been a while since asked about our US launch, but I just wanted to give you a quick heads up that IDAGIO is now officially available in the US and Canada. Let us know if you have any questions or feedback via our website. I like being told what to listen to. But I like the element of discovering stuff I might otherwise never hear. Funnily enough I also think teachers know better than the people they teach which is how they are able to introduce students to stuff they might not otherwise encounter. Similar principle. IDAGIO probably more than Classic FM will pander to ‘I know what I like and like what I know’. Classic FM also brings stuff to the table you wouldn’t otherwise encounter and not all of it terrible! And BBC 3 brings lots of live events. If I want a specific thing I pull out a CD. Radio offers me what I may not have thought of, may not have heard of, may not have access to. I think we are in danger of losing the remaining radio stations as it is. All very well that there is yet another new alternative, for those who like working with apps, but the less we listen to BBC 3, Classic FM and such stations, the more we endanger them — and all I have read here in recent months is complaints about places shutting classical stations down and changing them to religious broadcasting or whatever. Not sure this is a bandwagon that needs to be jumped on. We don’t think classical music radio is going away—unless all (conventional) radio goes away, which might be possible. But one could make the same arguments for the demise of adult contemporary or country radio. Music-oriented radio of all stripes needs to change to include some other compelling content. As I type this, I’m watching CNBC. Disney is down this morning because ESPN subscriptions are taking a hit. It seems they’re licensing their content to “non-linear” online content companies, (i.e., Netflix) and losing viewers as a consequence. It’s similar to the phenomenon addressed another recent Slipped Disc post about the lack of classical music record sales. There are already dozens of excellent recordings of many works in the repertoire. Why do we need “yet another” new recording of a warhorse? If the umpteenth cover of “I will Always Love You” hits the shelves tomorrow (as a single), how many would sell? Especially when one can go to YouTube or Spotify and listen to it ad infinitum for free, or practically free. Not many. Classical stations in the USA are generally found below 92 mHz (i.e., they’re non-commercial). They’re supported by universities and donors. As long as a few people go to real universities and get the opportunity to hear classical music, there will be at least some market for it. Perhaps the big concern isn’t radio per se, it’s the high cost of classical performance: Musicians have to train for years (like doctors) and naturally want to see some return on that investment. Orchestras need dozens of players, plus a talented—and expensive—music director/conductor. That’s a cost that keeps going up. So without robust ticket sales and the financial largesse of the philanthropic class, the model implodes. But it’s worth remembering that this is the historic model on which classical music has been based for much of its existence. Indeed, right up until Beethoven’s time, the viability of most music was predicated upon “the financial largesse of the philanthropic class” (entrepreneurs like Handel notwithstanding). Then, gradually, ticket sales supplemented and then supplanted, but never quite replaced aristocratic patronage. Democracy briefly stepped in, and is now rushing out again. The ancient lessons of the pólis are forgotten, or unlearnt. That which is allowed to collapse cannot come up Trump’s. Sometimes classical music belongs on shuffle, sometimes it doesn’t. I happen to like the wisdom and personality that radio hosts add to the presentation. Classical radio may indeed be contracting but not because of this app. It’s due to the aging audience for classical music and the fact that the younger generation has more varied musical preferences. A smaller potential audience makes it more difficult to sustain a mass media outlet like radio, whether it’s supported by ratings-driven advertising or audience-driven financial support. OK so I’m a miserable old so and so but I do get hacked off with the confected matiness and rehearsed spontaneity of one or two R3 presenters, because it’s all about the presenters isn’t it? But, and it’s a big but, would IDAGIO or someone like them support five orchestras and their concert seasons plus a six week summer Proms programme? Somehow I think not. So I’ll put up with the occasional inanity and burbling because the pluses far outweigh the minuses and, like Gary Carpenter, I’m still hearing new pieces. It is not wise to announce that an app can replace classical radio especially when its first vision seems to be so inconsistent in function. When I try to play music play I find it has intolerable slow reaction time. You need to wait 20 seconds if you want to switch from pause and play. And this app could easily shut down when you access music from searching. Christoph here from IDAGIO. Sorry that you had such a bad first experience with our app. I’d like to have a closer look at this, can you tell me a bit more about when and where you were experiencing the slow reaction times? You can reach me at cl@idagio.com – thank you and I hope we can sort this out for you, so that you can enjoy the app properly! This sounds wonderful. I have found Radio 4 from the Netherlands to be a great source of broad repertoire for those living in the US and Canada. It plays the standard Beethoven, of course, but I’ve only heard the Pines of Rome once in five years and that beats anything coming from US public radio! I hear the Pines at least weekly on the US stations. Also, Radio 4 has great commenters and they cover the Proms. The above comment does have some merit (though there are pieces I really never tire of), but not completely so. About the only time I listen to the radio anymore is in the car. And then it’s either local NPR talk or the classical station (now owned by PBS/NPR). Just this past week the classical station played two pieces of music by well known composers I had never heard before. Had they been played 100’s of times before? I can’t say as I don’t listen to the radio often, but they were “new” to me and I liked them well enough to purchase the MP3 albums they were on. “and music chosen for you by people who know oh-so-much-better than you do what you should be hearing (BBC/NPR). ” Really Norman! You might want to include yourself also. In any event, I agree with Peter. Whether it is from classical radio or pundits, I think both are still viable sources for one looking to expand their classical music listening options and coupled with options like Spotify, Amazon Prime, etc., at least you have the ability to listen to a piece of music before deciding on a purchase. I have been to many hundreds of live classical concerts over the years and if THEY were my only source of what music and composers to listen to I would imagine it would only be Beethoven, Brahms, Mozart, Schubert, Mahler (more recently), Schumann, and a handful of others. I find is truly astounding how small the repertoire is most most top orchestras, at least here in the U.S. and particularly in Boston where I live. I agree with your point about the surprisingly narrow range of repertoire America’s largest orchestras present. Aside from the occasional premiere number (short, tacked on to the beginning of the program), their idea of “novel” repertoire is typically along the lines of a Shostakovich symphony. Two American conductors who I think are doing fine work in terms of bringing repertoire to concert audiences that’s “rare and well-done” are Leon Botstein (American Symphony Orchestra) and JoAnn Falletta (Buffalo Philharmonic). It’s just too bad that more conductors and orchestras aren’t similarly adventuresome. Like all these new platforms, success can only come when they have enough content. My first five minutes searching came up with Gerald Finzi: nothing. William Walton: nothing. Arthur Bliss: nothing. Complete Handel operas: one. Complete Janacek operas: none. Until the repertoire expands beyond the ‘Classic FM library’, I’m unlikely to make any use of it. I went to the Apple store and I cannot find this app, today. good news: IDAGIO is now available in the US and Canada. Let us know if you have any questions via our website. idagio is not coming up in the APP STORE. Problem? I prefer the model of being told what to listen to, providing it’s an expert like Rob Cowan. I want to expand my horizons and be surprised. I agree. Also I don’t want my surprises to be selected by some inane robot that thinks it can second guess me. Tried the app and really like it so far. Sure, many of my favorite recordings are still missing, but honestly, I’m just super happy that finally someone seems to get the metadata right. And looking at their blog, it seems that they are adding a lot of recordings. Excited to see where this is going!